Kimitec Bioalgax Liquid Kelp is derived from Ascophyllum Nodosum - a type of kelp that is grown in the northern Atlantic Ocean. Bioalgax Liquid Kelp is dark in color - almost black. Its high in pH about 10 so take caution in when mixing with other chemicals and pesticides. 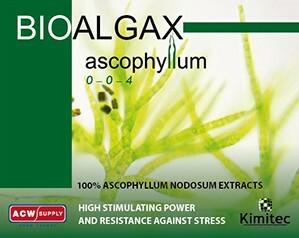 Its recommended that Kimitec Bioalgax is applied as a foliar spray but can also be used through traditional irrigation.